NORTH ADAMS — Three guys — a Frenchman, and two Americans — walk into a museum. One of them has an idea. He’s going to make a giant indoor waterfall with not much more than a hose and chunks of second-hand Styrofoam. Another thinks, Hey! You think that’s good? I’m going to pour molten brass over crazy-colored beach towels, then prop them up against the wall, with — wait for this — handwritten wall labels. A third says, You guys ain’t seen nothing. I’m going to chop up and cannibalize my own paintings. It’s not much of a joke, I admit. The real punch line may be that, when it comes to spectacular, show-offy work, the three artists in question — Guillaume Leblon, Jason Middlebrook, and Joseph Montgomery — have exhibits that are demure by the standards of the venue they now share. That venue is the Massachusetts Museum of Contemporary Art in North Adams, which is right now looking as good as I’ve ever seen it. When it comes to art on an awesome scale, Mass MoCA has few rivals. Its current menu of shows includes a stupendous exhibit by China’s Xu Bing, comprising an ambitious animated film, several large-scale installations (one incorporating thousands of cigarettes), a re-creation of the artist’s studio and, suspended from the ceiling, two huge — and I mean huge — phoenixes made from Beijing construction debris. At the same time, the museum is hosting a festival of one-minute films; an installation by Mark Dion that is an eight-sided room, chock full of miscellaneous stuff, installed inside a gallery; and a heart-stopping exhibition of a series of work, hundreds of feet long and made over a period of almost fifty years, by Britain’s Tom Phillips. Oh, and let’s not forget the Sol LeWitt wall drawings retrospective, which extends over three floors of an entire building. “Fine art” — the sort of thing, that is, that looks as if it might have been made with a domestic interior or commercial gallery in mind — has never looked terribly comfortable at Mass MoCA. Which is fine, because Mass MoCA tends not to invite it in. Leblon, Middlebrook, and Montgomery, however, all make fine art: human-scale, beautifully finessed, three-dimensional objects that sit on the floor or confidently ride the wall. All three shows were put together by curator Susan Cross, and all look remarkably good. Middlebrook’s is the first work you see as you enter. He takes tall planks of wood — curly maple, ash, English elm, and Cairo walnut — from a mill in Sheffield, Massachusetts, and paints them with striking designs in glossy, industrial colors. The planks, some as much as 20 feet high, have smooth, flat surfaces, but retain the organic shape of their edges. The painted patterns respond in places to the grain of the wood, but are for the most part abstracted, hard-edged, and superimposed on that grain. When curving lines appear, as in one especially tall piece with vertical, undulating, bronze-colored lines on a black ground, the effect is ravishing, recalling the op-art effects of Britain’s Bridget Riley – or long, cascading hair. Another work, “Keep Digging,” has a more colorful pattern that evokes the structure of an elaborate spider web. It spreads around a natural cavity in the timber. Middlebrook has applied the lines with spray paint, creating fuzzily elastic tonal transitions that lend the pattern an optical buzz. 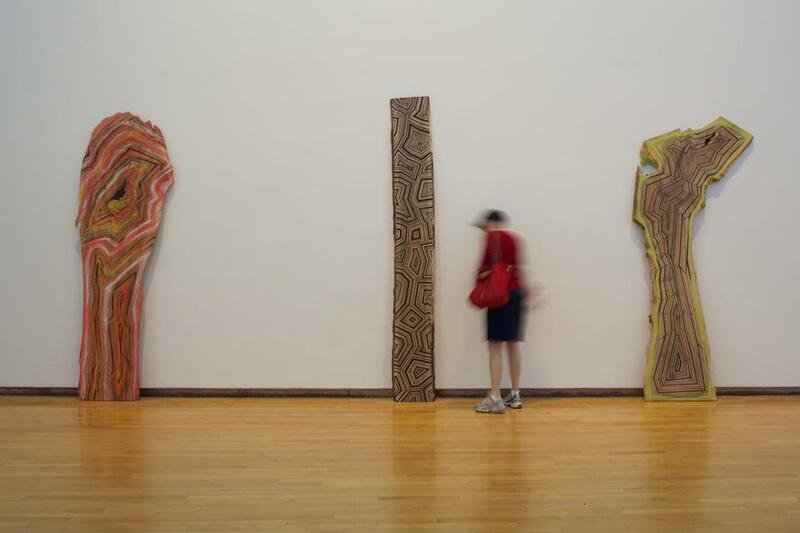 Other works, in sober hues of black and white, recall the crosshatch patterns, known as “rarrk,” on Australian Aboriginal bark painting. Middlebrook was born in Jackson, Michigan, in 1966, and now lives and works both in the Hudson Valley and the Berkshires. He has a thriving international career, and deserves it: his work is beautiful. Perhaps it’s this felt obligation to check right-minded boxes that makes the works that round out Middlebrook’s show feel a tad redundant. There are several large-scale pencil drawings showing imagined urban landscapes busy with industry, and the aforementioned Styrofoam waterfall. Titled “Falling Water” after Frank Lloyd Wright’s famous Kaufmann Residence, in Pennsylvania, the waterfall is certainly bold. The structure’s three tiers of Styrofoam were discovered abandoned on site at the museum. The installation, which forms the gallery’s centerpiece, is the kind of logistical coup that we’ve come to expect at Mass MoCA. But, unlike Xu Bing’s Phoenixes or Katharina Grosse’s 2011 spray-painted Styrofoam and dirt extravaganza, “One Floor Up More Highly,” I don’t think “Falling Water” is likely to live on in anyone’s memory, either as a spectacle or as a noble instance of recycling. If Middlebrook’s gorgeous, painted timber works are missing anything – and you register this only as you move into the show by Guillaume Leblon – it’s something to disturb the psyche; something enigmatic. Leblon, who was born in Lille, France, in 1971, and now lives in Paris, cultivates enigma. His work is fastidious to the point of preciousness: I imagine him wearing goggles and a lab coat in a secluded greenhouse, circling his delicate orchids, making sure the conditions are just-so, attending to every detail, attempting to produce something as beguiling and rare as possible. For all that, his show is brilliant. Titled “Under My Shoe” (the phrase conjures both obviousness and abjection) it is Leblon’s first solo show in a US museum. Carefully spaced around a gallery with handwritten labels on the wall and a floor covered in linen, his sculptures are both manufactured and assembled. Some conceal ephemeral, overlooked objects behind woven sheets of shiny copper alloys. Two stunning wall panels impress figurative shapes into plaster. Other sculptures combine discarded furniture with piles of sand, or fragments of figurative sculpture with bent sheets of cardboard. And others still submerge lurid beach towels, together with sand and shells, in molten brass, to create head-scratching monuments to junk, futility, and the ineluctable passage of time. Leblon’s work is unabashedly philosophical. It’s the kind you want to come back to. With titles such as “Probability that nothing will happen” and “Replica of a thing which is not there,” his works get you thinking about the strange life, and afterlife, of objects; about the imprint we leave on them; the imprint they leave on the space around them; and the imprint of time itself. It’s a credit to Joseph Montgomery, an artist in his mid-30s who was born in Northampton and now lives in New York, that his own sculptures and wall reliefs hold up well beside the work of Middlebrook and Leblon. 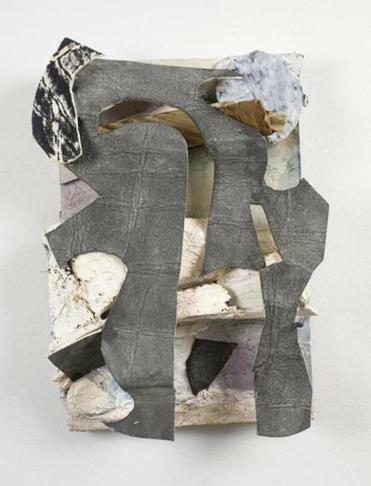 There’s nothing shatteringly new about Montgomery’s aesthetic, which combines elements of collage (his own work cut up and recombined, or “cannibalized”) with repeating minimalist forms. Each one of Montgomery’s works has an austerity that projects confidence and self-sufficiency, not a false or superfluous note. And yet the variety of materials he uses is dazzling. Four randomly sampled works include no fewer than 20 different materials, from paint, plastic, paper, plaster, and polystyrene to gouache, gypsum, canvas, and clay. There is a theme-and-variation structure to the show, as, for instance, rows of elongated wedges appear in different forms in different works. Sometimes these shapes morph into vertical striations in stone, or appear as an overlay in enamel paintings that incorporate fragments of shop signs. The show as a whole – as its weightlifting-derived title, “Five Sets Five Reps,” suggests – is given purpose and strength by these repeating forms. The variety in texture, weight, and color conveys a sense of endless possibility, which is confirmed by Montgomery’s simple, numerical titles: “Image Fifty Six,” “Image One Hundred Eighty Four,” and so on. But it is Montgomery’s almost classical sensitivity to form that distills his every, arbitrary-seeming gesture into distinct works of great specificity.